German Shepherd Pitbull Mix: A Dangerous Dog or Family Guardian? HomeBreedsGerman Shepherd Pitbull Mix: A Dangerous Dog or Family Guardian? The German Shepherd cross American Pitbull Terrier is a dog of mystery. Affectionately known as German Pit or the Sheppit, this dog is the best of both worlds. 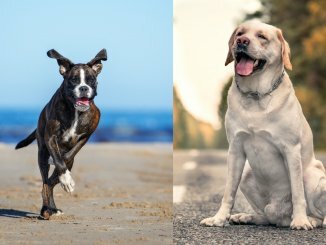 Both of these dogs have bad reputations when it comes to being aggressive, but with the right training and socialization, this couldn’t be further from the truth for this cross breed. They will inherit the loyal and loving personalities of their parent breeds. This dog will be devoted to you and your family, they are playful and mischievous. Is A German Shepherd Pitbull Mix A Good Family Dog? How Much Do German Shepherd Pitbull Mixes Cost? As you’ve probably guessed, it is a cross breed between a German Shepherd and an American Pitbull Terrier. This cross has a very interesting origin story, as no one is quite sure what these dog’s origins are! The current theory is that this cross came into existence due to the current trend in designer dog breeds, such as the Labradoodle or the Cockapoo. 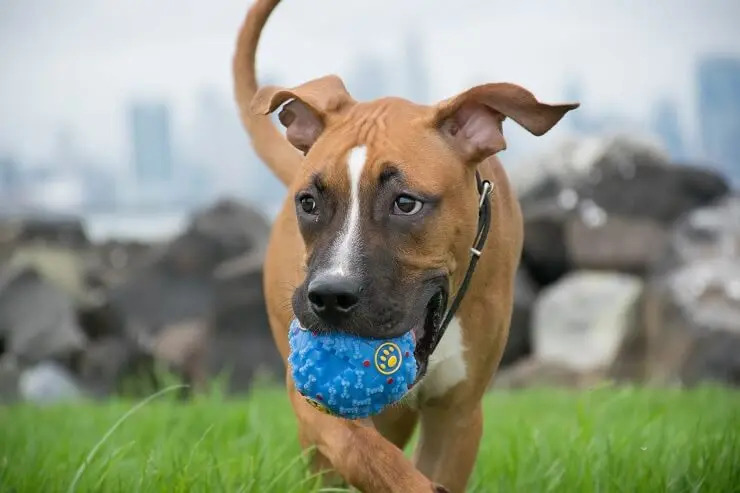 It is widely believed that this cross came to be as a result of the desire for the intelligence of the German Shepherd and the protectiveness and agility of the American Pitbull Terrier. As this dog is a cross breed, there are no kennel clubs that recognise them. However, both parent breeds are recognised individually by the American Kennel Club. Puppies tend to sell for between $200 and $600. These dogs are not a particularly popular cross breed and therefore finding a new puppy may be difficult. However, they can be quite commonly found in rescue shelters, so it may be a good idea to search for one there if your heart is set on this particular pooch! As with any cross breed, their appearance can be potluck and will vary within the litter. It all comes down to the genes they get from either parent breed. So, as both parent pooches are larger dogs, it makes sense that this dog is also on the larger side. Either way, the face will generally look more like a Pitbull, with a broad head and short muzzle. They will have a stocky build and defined muscles. The height and weight of a cross breed depends on how much their genes favor a certain breed over the other. If the puppy favors the German Shepherd genes, they will be bigger. Whereas, if they favor the Pitbull genes, they will be smaller. German Shepherds will generally weigh between 50-90lbs whereas a Pitbull Terrier is 30-70lbs. So you should expect your mix to weigh somewhere between 40-80lbs. As far as height, you can expect them to grow to 17-24 inches. One important thing to note about this dog is that it is impossible to predict what color your dogs coat will be. Depending on the individual parent color, there is a whole range of colors your dog may be. German Shepherd dogs tend to be bicolor, brown and black dogs. 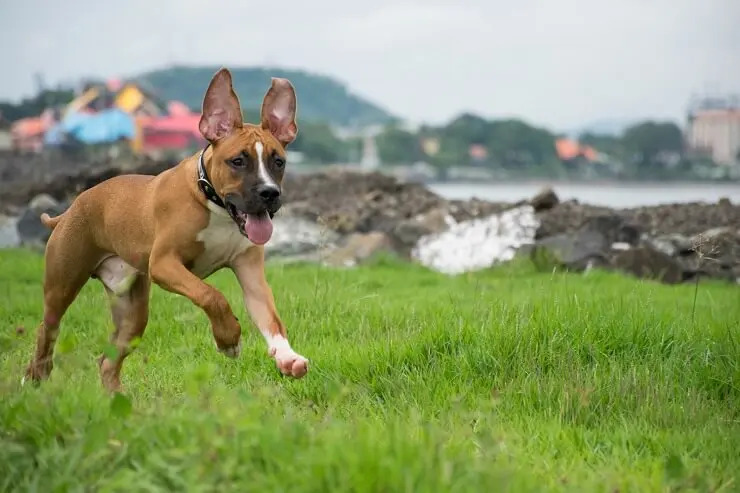 American Pitbull Terriers can be single, bi or tri color dogs, with coats that are black, fawn, brown, white, tan, red, brindle, blue and/or grey. As a result of all these different color combinations, it impossible to say what specific color your puppy will be. As the German Shepherd Pitbull is a cross breed, the coat can also vary. If they favor the German Shepherd genes, it can be a double coat at medium length. It will have a thick, soft undercoat, and a coarse outer coat. This will require weekly brushing, and more during the shedding season. If they favor the Pitbull genes, they will inherit a short, stiff coat. It is of course possible to get a perfect hybrid of the two. When it comes to brushing and bathing your dog, try to start doing this from a young age to get them used to it. Just like any other cross breed, it can be difficult to predict their exact temperament. However we can get a good idea by looking at each parent breeds temperament. The German Shepherd is intelligent, loyal and confident. They are territorial, which means they have an innate distrust of strangers. But with the right socialization and training you can reduce their distrust. German Shepherds are very energetic and don’t do well on their own. They can get bored very easily and will start to chew everything in sight. American Pitbull Terriers are also prone to chew things when bored. 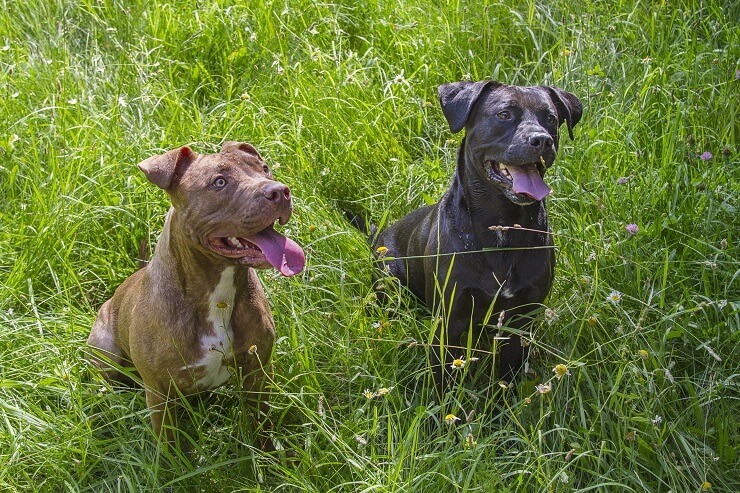 The American Pitbull Terrier is also very loyal, playful and energetic. They love their human family, but don’t tend to be friendly to other dogs. They can be aggressive at times, but with the right socialization and training, this isn’t a problem. With these two parent breeds in mind, the German Shepherd Pitbull mix will be very affectionate and loyal to their family members. They are very likely to chew things and will be very energetic. This mix will make the perfect guard dog. This dog also won’t do well on its own for long periods of time. So if this is the dog you want, you need to commit your time to them. This mix will become very attached to their family and will be devoted to you. A big family is perfect for them, as there will always be someone to keep them company. It was found that dogs are less likely to experience separation anxiety when owned by a family. As with every dog, children should be taught the boundaries of your dog and not to provoke an accident (teaching your children about dog body language will help). With the German Shepherds’ intelligence and the Pitbulls’ eagerness to please, this mix will be easy to train. Just like any other breed, you should use positive reinforcement training techniques. Punishing your dog can lead to underlying behavioral issues. You should start training your puppy the moment you bring them home; obedience training as a puppy is important. Whilst it isn’t impossible to train an older dog, it is much harder than training a puppy. Early puppy socialization is also important with a breed like this because they can be unpredictable when meeting strangers. Make sure your puppy is exposed to a range of people and dogs at a young age. Mental stimulation is also very important with this breed as they can easily get bored and will become destructive. To keep them occupied, give them some study toys and puzzle feeders. Playing with your dog will also prevent boredom. Games such as chase, tug of war and hide and seek are beneficial for your dogs’ behavior. It has been found that playing with your dog after training them, will boost their memory and decrease their stress levels. As this cross breed is highly energetic and agile, they will also benefit from dog sports, such as agility class. 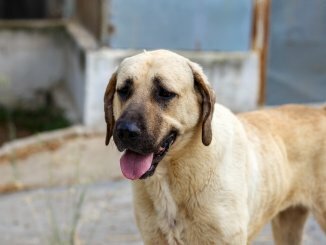 This cross breed needs an experienced owner who has the time to care for a dog that doesn’t like to be alone. The German Shepherd Pitbull needs a large yard to run around in and play in. They aren’t suited for apartments. This dog is not for the faint hearted as they can be a challenge! Therefore, this pup is not recommended for first time owners. They are also not recommended for homes with small children on account of their size and mischievous nature. This cross breed has high energy levels and will need daily walks and exercise – 90 minutes of walking each day will be enough to tire them out. This can be split into a brisk walk twice a day. When walking this dog, it is best to keep them on a leash as they don’t react well to other dogs. They also need to play throughout the day. Playing chase, fetch and other games will keep them happy. There is also potential that they will enjoy a good swim every now and again so regular trips to somewhere they can let loose will do wonders for their physical and mental health. Due to their size and exercise requirements, these dogs do not do well in apartments or small houses as they need room to roam freely. Finally, as these breeds are prone to hip dysplasia, it is important to take precautions to make sure your dog does not become obese, especially if your dog has hyperthyroidism. This means lots of activity to keep your dog’s weight down. Their coat can be unpredictable as they can inherit either the German Shepherd coat or the Pitbull coat. Or even a mixture of both. If they inherit the German Shepherd’s double, medium length coat, it is best to brush them weekly. They will most likely shed throughout the year and have a blow out once a year. If they inherit the Pitbull’s short and stiff coat, grooming will be fairly easy. Brushing will only be needed occasionally. You should always brush your dog’s teeth regularly or give them a dental stick alternative. Also clip their nails occasionally to avoid overgrowth and splitting. Check the inside of their ears for wax build up and debris. Every dog needs a healthy, balanced diet. In a healthy diet they need protein to keep healthy. In fact, they don’t like meals with little protein in it. They get their most concentrated source of energy from dietary fats. Essential fatty acids also keep they coat shiny and healthy. When you get your puppy, you should stick with the food the breeder was feeding them. You can gradually change it if you want but be aware of stomach upsets. As a puppy, you should feed them 4 times a day. How much you feed them once mature is dependent on their weight. The bigger the dog is, the more you will feed them. A rough estimate is 1.5 cups of kibble for 30-40lbs and 2.5 cups for 50-60lbs. If in doubt, ask your vet. Whatever you decide to feed them is most likely fine, as long as you feed them high quality ingredients and avoid filler ingredients like corn syrup. These ingredients are high in carbs and can be harmful. Obesity is a common problem with this breed. To prevent this make sure you exercise them every day, and avoid giving him too many treats and leftovers. When feeding them, try to avoid wet and canned foods. These can cause Irritable Bowel Syndrome in dogs. This is a common problem with Pitbulls, so it may be better for your dog to avoid these foods all together. Cross breeds are generally healthier than pure breeds because there is more genetic variation. However, issues can still arise with mixes. To get a better undertaking of known health problems we can look at the parent breeds. The American Pitbull Terrier and German Shepherd both have predispositions to suffer from Hip Dysplasia. This can lead to painful arthritis due to the joints not forming properly. Pitbulls can suffer from allergies. The most common is skin allergies, which can be caused by fleas. German Shepherds also suffer from food allergies. German Shepherds suffer from bloating, which can be caused by a build up of gas in the stomach. Commonly caused by eating too quickly or exercising straight after a meal. Pitbulls also suffer from hypothyroidism, which means their metabolic rate is abnormal, causing weight gain. How Long Do German Shepherd Pitbull Mixes Live? The average lifespan of a German Shepherd Pitbull mix is 10-12 years. If you feel like the German Shepherd Pitbull mix is the breed for you the next step is to find one. This means you need to find a reputable breeder. To make sure you are buying from a responsible breeder you should ask to see the puppy with mom and the rest of the litter. If the breeder doesn’t want you visting, then chances are they are not trustworthy. Seeing the puppy with mom will give you an idea about what temperament the puppy has and will give you a chance to see mom’s health and personality. You should ask the breeder questions too, like, what are you feeding the puppy and what socializations have they been exposed to. A trustworthy breeder should provide you with health certificates of the puppy’s parents and will let you know what vaccinations the puppy has had so far. Some breeders may even be taking part in hip dysplasia genetic screening, which has been shown to help reduce the prevalence of the disease. A puppy should be able to leave mom when they are 8 weeks, but some breeders may wait until they are 12 weeks old. The German Shepherd Pitbull will cost between $300 to $1000. This loyal and playful dog is best suited for experienced owners who don’t have very young children and other pets. Whilst they have an innate distrust of strangers, with proper training and socialization they won’t be aggressive. The German Shepherd Pitbull mix does not like being alone for too long, so be prepared to commit your time to this loveable dog. They also need at least 90 minutes walking each day, and regular mental stimulation to prevent chewing. If you feel like this is the dog for you, don’t hesitate because of their bad reputation – this dog has the potential to love you unconditionally! 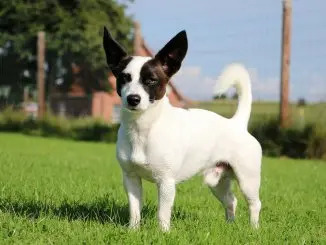 Jack Russell Chihuahua Mix: Is This Tenacious Terrier The Dog For You?